On May 10 former Navy SEAL 10 member Carl Higbie published Enemies, Foreign and Domestic: A Navy SEAL’s Story. The book highlights the difficulty of winning on the battle under President Obama and the equally daunting task of telling the truth of the enhanced politicization of the military post-George W. Bush. Enemies, Foreign and Domestic contains a lot of information for individuals who have wondered what it is like to be a SEAL or what the process of becoming a SEAL entails, and it provides background on Higbie and his childhood experiences. But the book ultimately turns on the unnecessary death of SEAL Tyler Trahan and on Higbie’s involvement in Operation Amber–the operation launched to capture Al-Isawi, “the Butcher of Fallujah,” in September, 2009. Trahan was an explosives ordinance disposal technician (EOD) who went out with Marines for a break in the monotony during Higbie’s second deployment. While Trahan was out, Higbie heard a huge explosion close to base and upon investigation realized Trahan had been killed. Higbie said he “seethed” over the unnecessary death when he realized the Marines had discovered “a 155 artillery shell turned IED” which commanders would not allow Trahan to detonate in place. Rather, they ordered him to move the IED–“to take it back to the base and blow it up there.” Trahan protested, but to no avail. And when he complied with orders and tried to move the shell it exploded, killing him. Things only got worse with the events that unfolded after the capture of Al-Isawi. 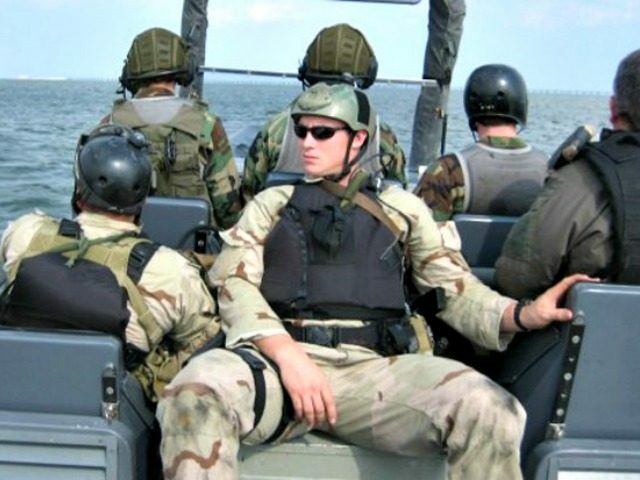 Following the capture, Higbie saw a number of his fellow SEALS offered up for punishment by their commanders as a way of appeasing those who were either upset over the capture of Al-Isawi or over the fact the SEALS had actually gone out, engaged, and won in spite President Obama’s demeaning rules of engagement. “Aside from Osama bin Laden, [Al-Isawi] was the most wanted terrorist in the world” in 2009. Yet Higbie says that he and his fellow SEALS captured Al-Isawi without a fight and brought him to a holding cell without a mark on him. At some point, Higbie speculates, Al-Isawi wounded himself inside the cell, then claimed the SEALS had done it while capturing/transporting him. A Master at Arms 3rd Class named Westinson made allegations that fit the scenario Al-Isawi wanted the world to believe, and the celebratory mood spawned by the capture soon gave way to intense interrogations whence superiors and Navy Criminal Investigative Service personnel pressured Higbie and his fellow SEALS to own up to having hit, beaten, or otherwise abused Al-Isawi. But they refused to claim guilt for something they had not done. The SEALS returned to the United States in a staggered sequence in the aftermath of the allegations, but all arrived by October, 2009. They remained steadfast in their claims of innocence–refusing to plead guilty when pressured or shamed to do so–and in February, 2010 they were flown back to Baghdad to be included in the courts martial over the allegations. Higbie was never actually charged, but he was there was with his fellow SEALS Keefe and Gonzales, both of whom were on trial. Both Keefe and Gonzales prevailed in their trials, as the accusations made by Westinson crumbled under scrutiny. Having told the tragic story of Trahan’s death–along with various accounts of the humiliation SEALS faced for not admitting guilt when innocent regarding Al-Isawi–Higbie uses the remainder of the book to discuss the struggle he faced while pursuing permission to tell his story. Higbie was not disclosing classified information, so he knew he could not legally be prevented from telling the story–but he soon learned that measures of legality don’t really matter to people who want to conceal actions they have taken or words they have said. The story behind securing the publication of Enemies, Foreign and Domestic: A Navy SEAL’s Story is a story in itself.